Frontier Village showcases the lives of prairie pioneers, with original prairie town buildings housing many frontier antiques and artefacts. Features of the village include the Kirkpatrick Gallery, the Louis L'Amour Writer's Shack, and an outdoor amphitheatre, as well as stagecoach and pony rides. 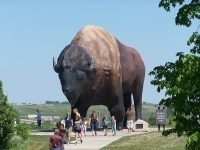 The National Buffalo Museum has a buffalo herd on its property with three albino bison: White Cloud, Dakota Miracle, and Dakota Legend. Native Americans traditionally hold the white buffalo as sacred and they are extremely rare. Opening times: Buildings and stores 9am-9pm, Memorial Day to Labor Day; buildings 9am-7pm in May and September. Gates open all year.